Zinc Origin for acute and persistent diarrhea in connection with ORS. Zinc Origin 10mg /5 ml syrup. Zinc sulfate heptahydrate 0.8793 mg equivalent to 0.2 gm zinc. Aspartame, Mono propylene glycol, Sorbitol 70% solution, Methyl paraben base, Propyl paraben base, Rose calor, Peach flav6TIfand Purified water. * Zinc Origin is a source of Zinc which is an essential trace element and involved in a number of body enzyme systems including alkaline phosphatase, lactic dehydrogenase and both DNA and RNA polymerase in addition to the importance of Zinc in the formation and function of the immune system. * Zinc deficiency can occur as a result of inadequate diet or malabsorption and excessive loss can occur in trauma, burns and protein loss conditions. * Zinc improves absorption of water and electrolytes thus; Zinc supplements prevent subsequent episodes of diarrhea. WHO and UNICEF reccmmend daily zinc supplements for children with acute diarrhea to curtail the severity of the episode and prevent further occurrences in the ensuing 2 -3 months. * Zinc facilities wound healing; helps maintain normal growth rates, nonnal skin hydration and the sense of smell and taste. – Bioavailability is about 20 – 30 %. – Zinc is distributed throughout the body with the highest concentration found in muscle, bone, skin, and prostatic fluids. – It is primarily excreted in the feces. Small amount are lost in urine and perspiration. * Acute and persistent diarrhea in connection with ORS. * Zinc deficiency states such as acrodermatitis enteropathica. * Other indications: Wilson’s disease, acne vulgaris, rheumatoid arthritis, psoriatic arthritis and immune- deficiency states including control of recurrent infections especially in case of Down’s syndrome. Patients with hypersensitivity to Zinc. * Zinc reduces the absorption of Ciprofloxacin, Levofloxacin, Norfloxacin, Ofloxacin, Tetracyclines, Oral iron, Penicillamine and Trientine. * Zinc absorption is reduced by Tetracycline, Calcium salts, Oral iron, Penicillamine and trientine. * Accumulation of Zinc may occur in case of renal failure. * Prolonged administration may lead to ccpper deficiency. * As all medicaments containing sorbitol, it is recommended not to be used for uncontrolled diabetics. N.B. It’s recommended to take the drug with or after food to avoid GIT disturbance. 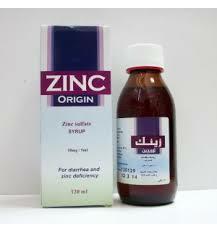 As any other medicament, Zinc origin should be used during pregnancy & breast feeding under medical supervision. – Infants under 6 months: 10 mg elemental Zinc (5 ml) daily. – Children above 6 months: 20 mg elemental Zinc (10 ml) daily. N.B. Treatment should be ccntinued for 10-14 days to prevent recurrence of diarrhea. – Children under to Kg: 22.5 mg elemental Zinc (11.2 ml) daily in – divided doses. – Children within 10 to 30 Kg: 22.5 mg elemental Zinc (11.2 ml) 1 to 3 times daily. – Adults and children over 30 Kg: 45 mg elemental Zinc (22.5 ml) 1 to 3 times daily or a directed by the physician. Carton box containing one glass bottle 120 ml and inner leaflet. Store at a temperature not exceeding 30 ·C. Egyptian Group for pharmaceutical Industries “EGPI”. Acute and persistent diarrhea in connection with ORS.